Alan Thicke died on Tuesday at the age of 69. The Growing Pains star had a heart attack. Many celebrities who admired Thicke’s work, both acting in sitcoms (Fuller House, How I Met Your Mother) and writing their theme songs (Diff’rent Strokes, The Facts of Life), took to social media to remember the actor and pay their respects to his family. Read tributes from Bob Saget, Ellen Degeneres, John Legend, and others below. 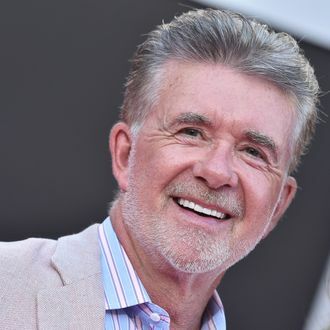 I spent Monday through Friday for seven important years with Alan Thicke as my "TV dad." I'm shocked and truly heartbroken today at the news of his death. Alan was a generous, kind and loving man. I am so blessed to have grown up with him. Chelsea and I send our love and prayers to his family tonight. We will cherish the memories... "sharing the laughter and love." Rest in peace Alan Thicke - You brought so much light, love and humor to the world! Deeply grateful for your friendship and wisdom. Condolences to the family of @Alan_Thicke. If ever there was a time celebs are thinking about our mortality, 2016 is it.
.@Alan_Thicke was always so gracious & kind to me. A very very cool guy. Rest In Peace my friend. God bless this great Canadian!